Maybe because it doesn't get much competition from Little Chocolate Donuts (the donuts of champions), but more probably because of its genius marketing, Wheaties has been a breakfast staple for little athletes everywhere. Let's take a look at look back at some of the stories that make this cereal so great. In its early years, Wheaties put photos of famous sports figures on the side panels or back of their boxes. Lou Gehrig was the first athlete to appear on the box, and the first female was not a sportswoman, per se, but an aviatrix "“ Elinor Smith. Wheaties didn't put a woman on the front of their box until 1984 (over 30 years after the first male athlete appeared in that spot), when gymnast Mary Lou Retton graced the cover. The first athlete to appear on the front of the box was decathlete Bob Richards in 1958. Believe it or not, of all the sports represented on the Wheaties box, football did not make the front cover until 1986 when Walter Payton added his own brand of sweetness to the mix. One of history's most enduring cereal box slogans was conceived on the spur of the moment. When Wheaties first started sponsoring radio broadcasts of Minneapolis Millers baseball games in 1933, their agreement included a large sign at the ballpark promoting the cereal. When asked what he wanted the sign to say, an ad exec for Wheaties thought for a moment then blurted out, "The breakfast of champions. 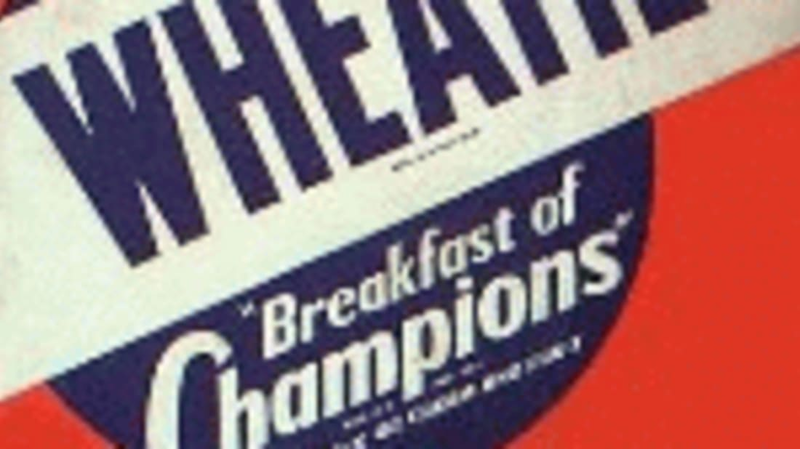 " The company eventually sponsored various baseball teams across the country, and testimonials by famous athletes became a staple of Wheaties radio commercials. 6.Â Â Â Cal Ripken, Jr.